Wes Craven’s A Nightmare on Elm Street is a global cultural phenomenon that has given eternal life to its legacy and its villain, Freddy Krueger. FredHeads is a documentary that shines a spotlight on the fervent fans within the Elm Street community. As A Nightmare on Elm Street is a global phenomenon that continues to thrive many years after its 1984 release, fans of all ages, both nationally and internationally, are invited to share their stories. With the central theme of how being a fan can change your life, FredHeads will feature enthusiasts of all types: passionate fanatics, life-long aficionados, cosplayers, creators, artists, filmmakers, kids, and more. The documentary will also feature insight from the stars and creatives involved in the original film series (Robert Kurtzman, Mick Strawn, Tuesday Knight, Lisa Wilcox, Miko Hughes, Ricky Dean Logan, Toy Newkirk, Danny Hassel, Andras Jones, Kelly Jo Minter, and many more), exploring the enduring legacy, the cultural impact, and the passion of the Elm Street fan community. Venn Pictures is an independent film company who previously released the fan film Don’t Fall Asleep (2016), which follows Nancy Thompson between the events of the original A Nightmare on Elm Street and A Nightmare on Elm Street 3: Dream Warriors. It was narrated by original actress Heather Langenkamp and scored by the award-winning composer Lito Velasco. Venn Pictures and Northgate Pictures have launched an Indiegogo in order to complete production on the ambitious project. 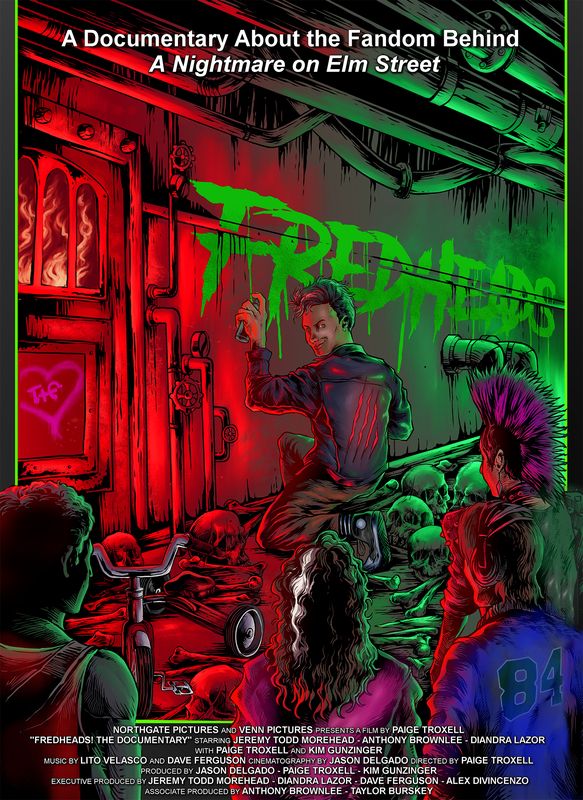 The crowdfunding campaigns allows fans to pre-order a limited edition DVD of the documentary, ensuring that they will be among the first to see FredHeads. T-shirts, pins, posters, soundtracks, and sunglasses are among the available merchandise. One-of-a-kind perks from Elm Street alumni are also up for grabs, including prop replicas signed by Freddy Krueger himself, Robert Englund. The documentary also features insight from the stars and creatives of the Elm Street franchise, exploring the enduring legacy, cultural impact, and fan community. Interview subjects include Lisa Wilcox, Robert Kurtzman, Tuesday Night, Miko Hughes, Danny Hassel, Andras Jones, Toy Newkirk, Kelly Jo Minter, Ricky Dean Logan, and Mick Strawn, among others. The FredHeads team loves to hear from fellow fans, so be sure to visit http://facebook.com/FredHeadsDoc to find out how you can submit your story.